Offaly student Ronan Walsh was awarded the Science Foundation Ireland ‘Best Overall’ award at this year’s SciFest@Athlone Institute of Technology for his innovative domestic greywater eco-treatment system designed to give gardeners a viable and sustainable source of irrigation water in times of drought and restrictions. His project ‘Beat the Drought’ uses reclaimed waste water from baths, sinks, washing machines, and other kitchen appliances, for garden irrigation and stems from last summer’s drought and ensuing hosepipe ban. “Instead of relying on expensive treated and sometimes scarce mains water, you can use recycled greywater for uses that do not require drinking quality of ‘potable’ water such as the irrigation of garden plants,” the Coláiste Choilm student said. “So, I came up with a way to harvest it instead of disposing of it in our Puraflow system.” Ronan’s experiment was a resounding success and resulted in the development of a fully functioning staged greywater reclamation system complete with electronic data logging and analysis and a web interface. Climate change was a common theme underpinning many of this year’s entries with many students focussing on topics like biodiversity, pollinator populations, water availability and recycling plastic into bricks to make houses more thermally efficient. 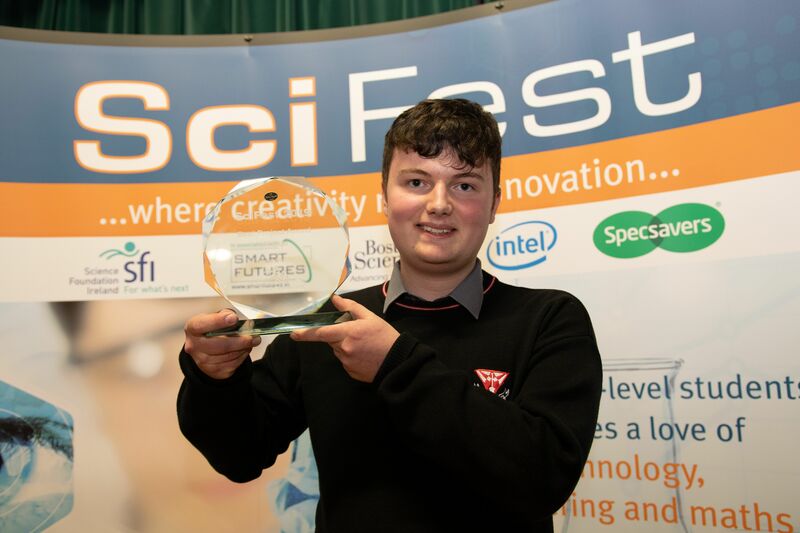 Ronan was also awarded this year’s Air Products’ Air and Water Quality award, and will go on to compete in the national final in Dublin in November and, if successful, will go on to represent Ireland at the International Science and Engineering Fair in Anaheim, California in May 2020. Elsewhere, Athlone Community College students, Amy Fallon and Andrea Whyte, were awarded ‘Best Runner-up’, an award sponsored by Abbott. The duo’s project showcased how artificial neural networks and autoencoders could be used to detect when an internet connected toy had been hacked. In total, the school took home four first place in category awards, three special category awards, two third place in category awards and one highly commended award. Meanwhile, Our Lady’s Bower took home the ‘Best School’ award for the third year in a row. The award, sponsored by Athlone Institute of Technology, was one of 17 prizes the school won at this year’s SciFest competition. Now in its 12th year, SciFest@Athlone IT has enjoyed considerable success nationally, growing year on year by a considerable margin. This year, more than 400 students from 24 secondary schools across the Midlands competed in the competition, exhibiting their projects and putting their knowledge of STEM to the test. SciFest is an all-inclusive, all-island science initiative which fosters active, collaborative and inquiry-based learning among second-level students. It involves second-level students showcasing science, technology, engineering and maths (STEM) projects at a series of one-day science fairs held locally in schools and regionally in 16 venues across Ireland, including 11 Institutes of Technology, TU Dublin (campuses), DCU and St Mary’s College, Derry. SciFest is funded nationally by Science Foundation Ireland, Intel, Specsavers and Boston Scientific, while SciFest@Athlone IT is sponsored by Air Products, Enterprise Ireland, Arran Chemical Company, Ericsson, PPD, NISO, Cunningham’s Pharmacy, Irish Life Sciences, Alkermes and Spectrum Signs. Science Foundation Ireland funds oriented basic and applied research in the areas of science, technology, engineering, and mathematics (STEM) which promotes and assists the development and competitiveness of industry, enterprise and employment in Ireland. The Foundation also promotes and supports the study of, education in and engagement with, STEM and promotes an awareness and understanding of the value of STEM to society and, in particular, to the growth of the economy. Characterised by a commitment to academic excellence, Athlone Institute of Technology is Ireland’s leading higher education institute and an institute of firsts –first for research across the technological higher education landscape, first to receive Academy of Pharmaceutical Science (APS) accreditation in Ireland, and first for ISSE student satisfaction nationally. The institute was awarded Sunday Times Institute of Technology of the Year 2018 and Runner up in 2017.